A new potato variety for us this year, you can read the technical spec. on it here; a red skinned tall maincrop covered by plant breeders rights until 2026. It wasn't our first choice but I can't remember what it replaced on our want list in the early spring. We think we chose it because it's recommended for chips and crisps, two of our favourite ways to enjoy the potato. 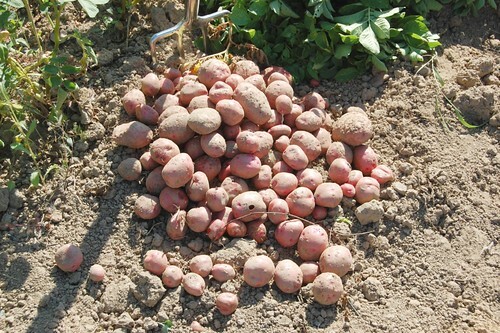 It's been a mixed year for spuds, little rain and a lack of humidity have helped keep blight away but the resulting dry soil has given disappointing yields and scabby tubers. The picture shows pretty much the full crop from 25 plants. Not impressive at all. Although there was no blight one or two plants did fall to the sort of virus infection that gives stunted weak leaves and a couple were mined by rodents so didn't contribute to the crop. That slug hole in the picture is probably the only one we found. Our soil is poor (yes, we're working on it!) and I don't feed in any significant way. I think these potatoes would have benefited from extra input so I'd recommend a wider planting distance than I gave these which was about 50cm between starts on anything less than perfect ground. The ones on the end of the rows were considerably more productive. Eating quality is good and the few crisps we made as a trial excellent. I'm not sure I'd grow them again but I wouldn't rule it out either.